When Do I Need Dishwasher Repair? If you are a new homeowner or haven’t really given your dishwasher much regard in the past, it can be difficult to know when your dishwasher may need some TLC. Not all dishwashers are alike. 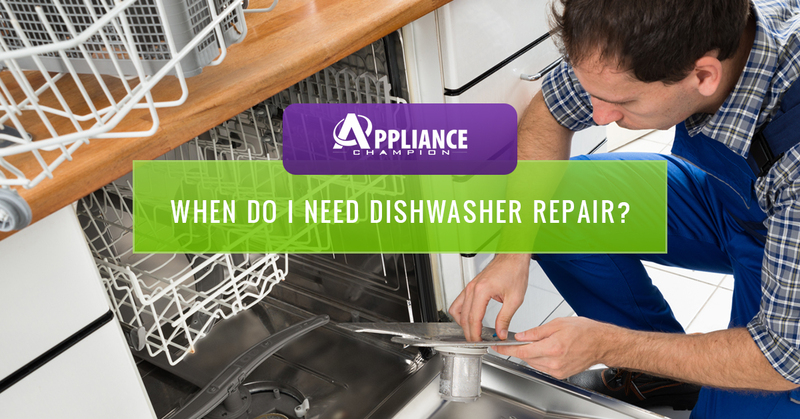 However, there are some general signs that all dishwashers show when they desperately need repair. 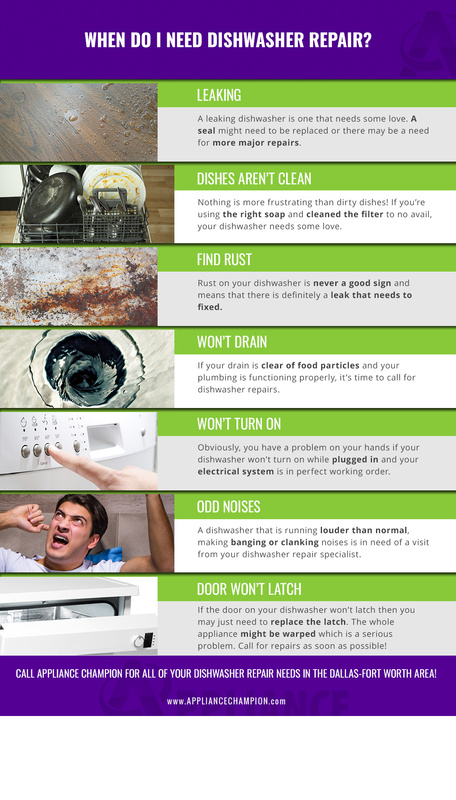 Keep reading to learn about seven signs that may show that your dishwasher needs some professional care, or you can contact Appliance Champion! We provide same-day dishwasher repair service for the Greater Dallas area including Grapevine, Arlington, Southlake, North Richland Hills, Keller, Arlington, Fort Worth, and more. Visit our website to contact us and learn more about our services. If your dishwasher is leaking on the floor, you have an obvious sign that there is an issue with your dishwasher. The only place that we should have a slip-and-slide is outside — not your kitchen! Not only is a leaky dishwasher simply not doing what it’s supposed to do — clean your dishes — but it also is probably damaging your floor and possibly the structures under your floor. Mopping up a little water isn’t a big deal, right? Repeated water exposure and subsequent water damage can not only damage your floors, but it can also warp your dishwasher. Additionally, water that isn’t properly cleaned up can lead to mold growth in your floor and other structures; mold can not only cause serious health problems, but mold also breaks down structural elements of your home as well. Nothing is more frustrating than having a dishwasher that doesn’t clean your dishes. What’s the point of having a dishwasher if it won’t clean your dishes? If your dishes come out looking foggy or covered with bits of food, there may be a couple of issues occurring. Check your dishwasher detergent and your appliance owner’s manual to find out if you are using the right soap. If not, change the detergent you use and see if the issue is resolved. However, if it isn’t, there may be another issue occurring in your dishwasher. A dishwasher that doesn’t clean your dishes isn’t normal. You deserve a dishwasher that does what it is supposed to do. It’s easy to assume that rust just happens to older things — old tools, cars, etcetera — but this isn’t true for your dishwasher. A rusty dishwasher may be a sign of its age, but it is also a sign that the appliance is leaking. If your dishwasher is leaking, it may be causing water and mold damage to your kitchen floor, wall, and other structural elements that you can’t see. Your dishwasher may also begin to warp as it leaks, exacerbating the issue and causing your dishwasher to no longer latch. Obviously, a dishwasher that will not drain is not a good thing and it’s also just plain gross. Before you panic that your dishwasher is broken, first, check to make sure that there isn’t any food clogging the drainage system. Secondly, check your plumbing to make sure that you don’t have a clog or other issue. If you are sure that all drainage systems are working and your plumbing is doing exactly what it is supposed to, then it may be time to call for dishwasher repair. If your dishwasher won’t turn on, then it is pretty obvious that you have a problem. However, it may not be your dishwasher’s fault. Before you panic, be sure to check your electrical system in your kitchen. Particularly in older homes, electrical systems of times past do not have the capacity to support all of the appliances and electricity needs of today’s homeowners and families. If you are sure that your electrical system can support your appliances, then it may be your dishwasher that needs a little TLC. Your dishwasher should never be the star of a horror film or make enough noise that it gives you a headache. It is completely normal for your dishwasher to occasionally make noises that are caused by dishes sifting during the washing cycle. Any other noise or one that just doesn’t sound “quite right” probably means that things aren’t quite alright with your dishwasher. Your dishwasher shouldn’t be drawing attention to itself like an angry child throwing a tantrum about having to do their chores. Like we said earlier, if the door of your dishwasher won’t latch, your dishwasher may need some repair. Obviously a dishwasher that won’t latch won’t run. Also, if it is becoming more and more difficult to latch, your dishwasher might be warping due to leakage. Another cause of your door not latching could be that your dishwasher was placed in a hole too small. Renovations and replacing your home’s original dishwasher may require altering the opening where you placed your original dishwasher. Before you purchase your dishwasher or make changes to your kitchen make sure your dishwasher fits comfortable in its space in your kitchen. Need Dishwasher Repair in Dallas-Fort Worth area? If your dishwasher isn’t running like it used to, call us for some Appliance Champion TLC! 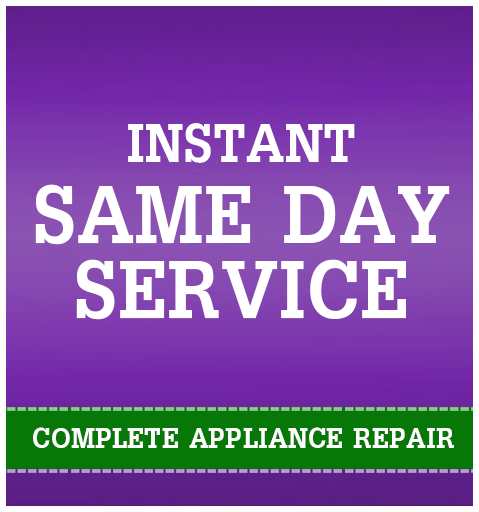 We offer five-star performance for same-day appointments because we understand that a broken dishwasher is an inconvenience and can completely disrupt your day and week. We have dishwashers for a reason, right? When you call Appliance Champion for dishwasher repair, you can expect a factory-certified repair tech who has undergone drug and background testing and has the right tools and brand-name parts to fix your dishwasher completely and properly. We will also take time to not only explain the issue and the repair, but also the on-going maintenance that your dishwasher needs to keep running well for months and years to come. Learn more about our dishwasher repair services and contact our professional repair techs and caring staff and experience the Appliance Champion difference!